Portuguese bank Espirito Santo has been unable to make short-term debt payments, exposing some of the challenges that are giving the ECB plenty of headaches. The difficulties demonstrated that a bank in a so-called peripheral country can still pose a systemic risk. However, interestingly enough, the EUR/USD pair lost just 32 points to $1.3608, even though indices were plunging sharply. The Federal Reserve's latest meeting minutes did not clarify the timing of next year's expected interest rate hike. That upset forex investors, who sold the dollar and headed into the euro instead. As a result, the EUR/USD pair rebounded by 30 points to $1.36401, with concerns that a hawkish Fed would be keen to rebalance its rhetoric being priced out. Ahead of tonight's FOMC minutes, European Central Bank President Mario Draghi reaffirmed his stance to ease monetary policy in order to spur growth and contain the danger of deflation. 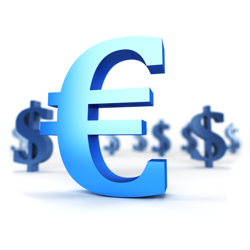 Nonetheless, the euro moved a tad higher versus the US dollar, gaining 6 points to $1.3611 as the German trade balance surpassed estimates. The shared currency regained 8 points against the dollar yesterday, closing at $1.3604 on possible bargain hunting after last week's sharp decline. In addition, the euro was helped by the fact that investors' confidence in Europe, as measured by Sentix, was much stronger than estimated. The shared currency dropped against the dollar for the fourth day in a row on Friday, this time losing 17 points to finish the week at $1.3593. The prospects of the ECB maintaining near-zero interest rates for a prolonged period is undoubtedly putting increasing pressure on the EUR/USD pair. This is only being exaggerated by evidence that the economic recovery on the other side of the Atlantic is much better defined.